From this tutorial well show you the newest globe promo bug tutorial.We all know that globe promo is expensive and a few Filipino cant afford it that's why i reveal this tutorial to avoid wasting your cash and gain a lot of services.Remember this web log has no liable just in case this tutorial doesn't work to your globe numbers take at your own risk. 1. Send GOTSCOMBOHBFA14 to 8080 and wait for confirmation. 2. Send GOTEXTDF80 to 8080 and wait for confirmation. 3. Done. You now have 1100 texts to all networks valid for 30 days! To check the status, just text GOSAKTO STATUS to 8080. To extend the promo for another 1 month, before your subscription expires, load 80 Pesos and text GOTEXTDF80 to 8080. 1. Send GOTXTALLD20 to 8080 and wait for confirmation. 2. Send ATXT80 to 8080 and wait for confirmation. To check the status, just text ATXT80 STATUS (or SUPERALLTXT80 STATUS) to 8080. To extend the promo for another 1 month, before your subscription expires, load 80 Pesos and text ATXT80 to 8080. 1. Send ATXT80 to 8080 and wait for confirmation. 2. Send GOTSCOMBOHAA17 to 8080 and wait for confirmation. You can check your remaining allnet texts by texting ATXT80 STATUS (or SUPERALLTXT80 STATUS) to 8080. The ATXT80 has 100 allnet texts valid for 30 days. The GOTSCOMBOHAA17 adds 1000 allnet texts which accumulates along with the 30 days validity of ATXT80. Text GOTSCOMBOHAA17 to 8080. You can use it many times for additional 1000 texts to all networks. 1. If you still have some remaining texts before the expiration of your promo trick, register to ATXT80 (send to 8080 and costs 80 Pesos) before the expiration of your ATXT80. 1. Send GOTEXTDF80 to 8080, or ATXT80 to 8080. 2. Send GOTSCOMBOGOTXT15 to 8080. 3. Done. You now have 3100 texts to all networks valid for 30 days! To extend the promo for another 1 month, before your subscription expires, load 80 Pesos. If you registered GOTEXTDF80, just text GOTEXTDF80 to 8080. If you registered ATXT80, just text ATXT80 to 8080. 3. Done. Send GOSAKTO STATUS to 8080 to check your 1.02GB data. a. For additional 1GB consumable data, send GOCOMBOIKEA48 to 8080. (Add PhP48) Other options for additional 1GB: GOTSCOMBOKEA37 / GOCOMBOAIEBFA38/ GOCOMBOAKEA53. a. Send GOCOMBOIKEA48 to 8080 for additional 1GB data. (Add PhP48) Other options for additional 1GB: GOTSCOMBOKEA37 / GOCOMBOAIEBFA38/ GOCOMBOAKEA53. b. Send GOCOMBOIKEA48 to 8080 for additional 1 GB consumable data. (Add P48). Other options for additional 1GB: GOTSCOMBOKEA37 / GOCOMBOAIEBFA38/ GOCOMBOAKEA53. d. Send GOCOMBOIKEA48 to 8080 for additional 1 GB consumable data. (Add PhP48). Other options for additional 1GB: GOTSCOMBOKEA37 / GOCOMBOAIEBFA38/ GOCOMBOAKEA53. How to Extend Your Existing 30-Day Promo for Another Month? To continue enjoying your current promos for the next month, text these codes before your subscription ends (i.e. an hour or two before your subscription expire) Make sure you still have remaining call, text or data allocation. a. Send GOCOMBOIKEA48 to 8080 for additional 1 GB consumable data. (Add PhP48). Other options for additional 1GB: GOTSCOMBOKEA37 / GOCOMBOAIEBFA38/ GOCOMBOAKEA53. a. For additional 1GB consumable data, send GOCOMBOIKEA48 to 8080 (Add PhP48). Other options for additional 1GB: GOTSCOMBOKEA37 / GOCOMBOAIEBFA38/ GOCOMBOAKEA53. How to Extend Your Existing 7-Day Promo for Another Week? To continue enjoying your current promos for the next week, text these codes to before your subscription ends (i.e. an hour or two before the subscription expire). Make sure you still have remaining call, text or data allocation. Send GOSAKTO STATUS to 8080. 1. Just text your chosen GOSAKTO Data Promo and wait for successful confirmation message. 2. To extend your chosen GOSAKTO data promo, choose one of the following GOSURF/GOSAKTO depending on your budget and needs. Former GOSURF promos like GOSURFBF50 and GOSURF10 are currently unavailable. For anyone who successfully registered GOCOMBOIKYA35 (2GB) before, you can still register it again by doing this trick. Dial *143# then press Call, then navigate thru > GoSAKTO > My Promos > Recent Promos > GOCOMBOIKYA35 > Subscribe Now, then wait for the SMS confirmation. These are the other GOCOMBO keywords which are not working anymore: GOCOMBOIKXA35, GOCOMBOIKOA35, GOCOMBOIKPA35, ERGOTSCOMBOAYA37 and GOTSCOMBOJYA44. "The system has detected multiple registrations from this mobile number and no longer allowed to register ..." When you encountered this, just wait for at least 15 minutes before you register again. Do not hurry to send another codes. Register during off peak hours like 1am-5am to prevent this from happening. The amount for the registration was deducted but the promo was not availed/registered to your account. There's no other workaround here and that is to call Globe Customer Hotline at 211 for free using your cellphone and report to them that your load was consumed a.k.a "kinain" during the registration. Globe will evaluate it and return the specific amount if your claim is valid. 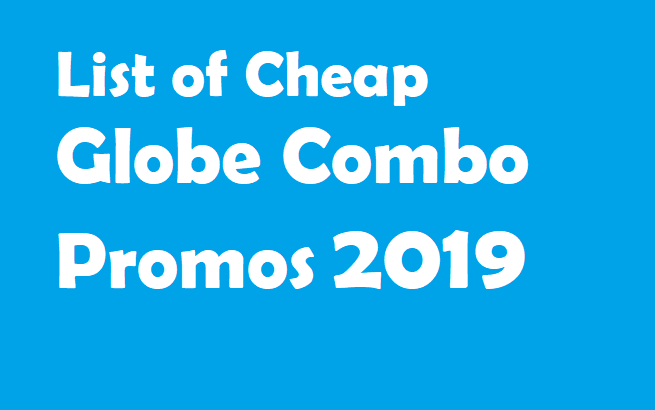 The availability of these promos may change, they might be temporarily unavailable or permanently unavailable, so be sure to check www.globe.com.ph frequently to know latest promos availability updates.